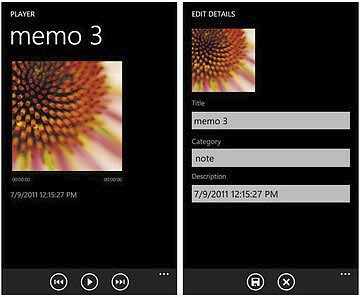 With a simple design and an easy to use interface, Voice Memos Lite is great for users to quickly add or record voice memos on the go on the Windows Phone 7. The main screen on the app has 3 sections: 1. A big button to record your memos. 2. A tile list of your recent memos. 3. Settings. 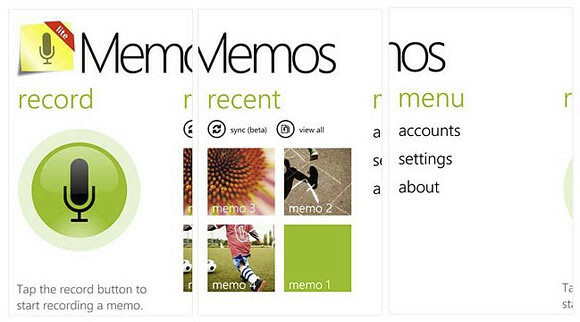 On the ‘Recent Memo’ page, tap on “view all” to bring up the category pages for your voice memos. ‘Settings’ include options to set up your Audioboo or Soundcloud account (for sharing files), setting up PC Sync, and default file names. Here’s how the app looks like on a black theme instead and the memo details editing screen: edit voice file title, category, description and adding a picture. Get Voice Memos Lite from the Marketplace for FREE now!